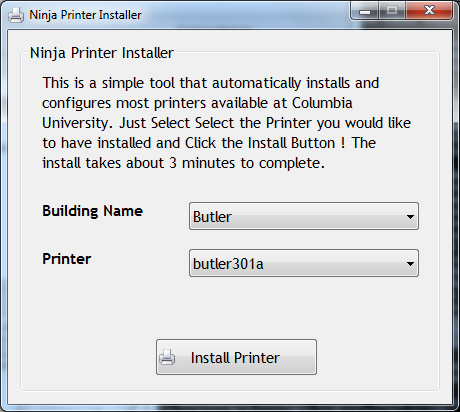 Ninja Printer Installer is a Windows program that will let you install most of the printers that are available to students on Columbia University's campus. While it is possible to manually connect to the CUIT printers, this process is a cumbersome one and often at times some students may not be aware that they can print directly to the lab printers. With this tool, adding new printers to your computer is an easy process and only requires the click of one button ! Ninja Printer Installer requires the .NET framework 3.0 or higher to be installed and it works with Windows XP, Vista, and 7 only.